So this is my most recent canvas art piece. It's my name in Arabic, with a mendhi design spreading around the edges of the canvas from the top right hand corner. Dark blue background, teal writing and silver henna patterns. I quite like the raised 3D effect with my name, which is the result of layering quite a lot of acrylic paint, but the mendhi design was a lot easier to do (same technique as this canvas art, with the 'henna cone' filled with paint). I'm currently in the process of setting up a blog page for my canvas art. 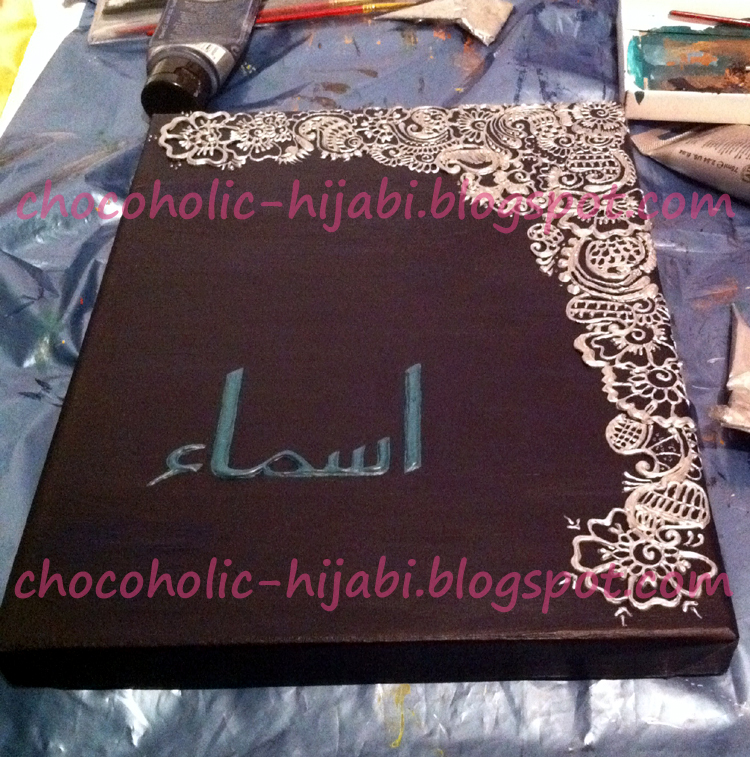 If anyone would like to order a personalised canvas, you can contact me for details and information at chocoholic-hijabi@hotmail.co.uk. congrats on your new venture! I would to follow you and see!!! MAshallah. Assalamualeikum wa rahmatulahi wa barakatuhu dear sis! MashaAllah, what beautiful artwork! Wa alaikum Salaam and JazakhAllah Khair! wowwwwww, its amazing can u please tell my which paint do u fill in the cones for making this mehndi pattern? ?